Increasing capacity and fuel economy - partial restoration of worn surfaces in the cylinder-piston group and ability to better retain grease seal clearances in the cylinder-piston group, provide the necessary gastightness. This leads to compression recovering, improves combustion quality. Moreover, dense oil layer displaces the friction regime in the direction of the hydrodynamic, which reduces the friction losses. All this leads to an increase of the engine power with simultaneous fuel economy by 6-8%. Noise and vibration levels reduction – recovering of compression in the cylinders leads to smooth engine running. In addition, a dense layer of oil softens work of friction parts. Altogether, it reduces vibration and noise in the engine. Restoration of functional properties of hydraulic compensators – protective layer restores optimum gaps in hydraulic compensators, which normalizes oil pressure and provides quality work of a mechanism. Facilitating engine start up and protection during «cold start-up» – treated surfaces are able to retain the oil layer during lengthy downtime of the engine. It facilitates the first shaft revolutions and prevents increased wear of engine with insufficient oil on friction surfaces at initial start-up, which is especially important at negative ambient temperature. The compound is designed to restore the performance and protect against wear the gasoline and LPG engines of passenger vehicles with mileage more than 50 000 kilometers. It can be used for forced and turbocharged engines. In case of swallowing consult, a doctor. Compound ACTIVE PLUS is compatible with any type of motor oil. The sediment on the bottom of the can is the main working element of ACTIVE PLUS - these are microparticles of minerals. It is crucially important to thoroughly stir the contents of the can before pouring it in the engine oil system (sediment color depending on the release batch can vary from light green to dark gray and black). Compound ACTIVE PLUS does not affect the characteristics and status of parts made of composite materials and rubber. 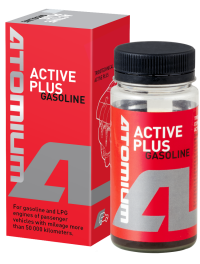 For providing continuous level of engine protection at each regular oil change it is recommended to apply Active Regular after the complete treatment with ACTIVE PLUS. To restore the transmission resource it is recommended to apply tribotechnical compounds MGSB, AGSB, REDUCER by Atomium. 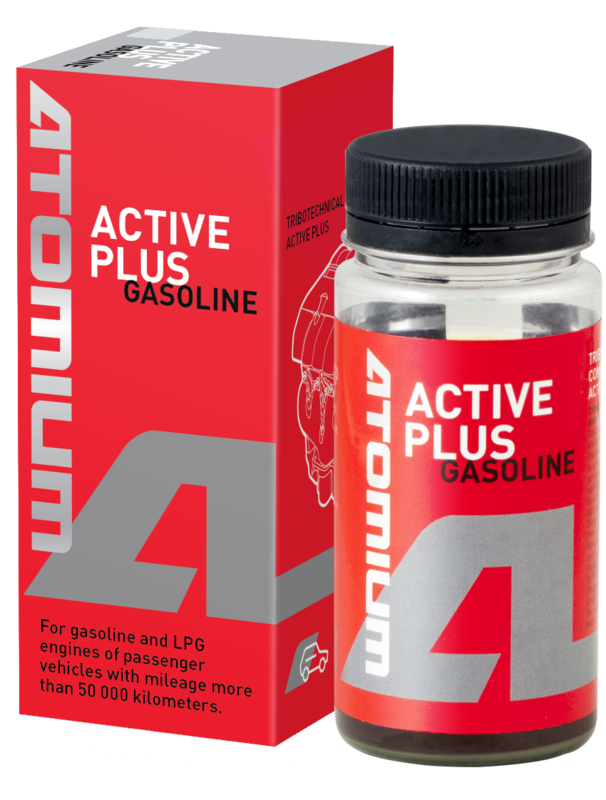 To restore the power steering characteristics it is recommended to apply compound HPS by Atomium. Apply 1 can through the regular oil filling neck. (If the volume of the oil system is more than 5 liters, it is necessary to fill in two cans of compound). After applying the engine should run (it is recommended to drive the car) for no less than 20 - 25 min. in the regular operation mode. * It is necessary to carry out oil drop test every 500-1000 km if the mileage to the regular oil change is more than 1000 km. In case the oil became solid black It is necessary to make oil replacement ahead of schedule and go to the second stage.